Fender 1964 Precision "Hot Rod"
"I have an award winning hot rod that has been featured in Car Kulture Delxue named "Bernadine'. I restored her back to the way my father and uncle had her in 1958. I inherited the car from my father and you can read all about it in Pinups and Kustoms and see all the photos of the restoration here. I found a great 1980's Precision Bass in Japan which was in fine shape. I bought the bass and when it arrived, I sent the body to my car builder, Artisans Rod and Classics in Indiana. I had them paint the bass body in Hot Rod Flatz black, to exactly match the car. Then I had Jim Studinsky come in and do the pin striping, also to match what he had done on the car. I really love this bass, it reeks of sentimental value for me." Below is the way the bass looked after buying it from an ebay dealer in Japan. 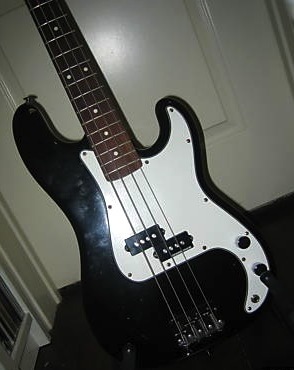 According to the serial number this is a Fender Japan Precision Bass from 1985-86. I knew I had to do something unique with it, but it took some real head-scratching for a few days to figure out what. I wanted to make a 1964 Fender Precision replica, highlighting as many of the features of that iconic bass as possible. I was both shocked and delighted when I took it apart and took the pick guard off. There were no routings at all under the pick guard, to include no typical channel routing from the pick up to the control cavity. This made it easy. I shipped the body off to my custom car shop in Fort Wayne - and asked them to fill the pick guard screw holes, sand it, seal it, prime it - and spray it Hot Rod Flatz to match my "Mutt Rod". I also asked them to get the pin striper in after the body was good and dry - and have Jim pin stripe the body to basically match the car. Below is a shot of the beautiful rosewood fingerboard and showing the vintage tinting of the neck. John Ingram leveled the frets and did the set up work. I kept the Seymour Duncan Basslines pickup that came in the bass - and I added a black custom diamond steel cavity cover. The look is completed with black steel knobs with mother of pearl inlays, and red bass strings to match the grill shell of the car. I have a battery powered Roland Cube bass amp which lives in the trunk and I take the bass to the car shows with me. The Precision was perfect for the small, loud bands that proliferated nationwide mid-decade in the first great wave of rock ‘n’ roll, which came along only a few short years after Fender introduced the instrument in late 1951. These seminal U.S. rock ‘n’ roll groups and performers were the precursors of the countless pop and rock groups that sprang to life on both sides of the Atlantic in the incredibly musically adventurous decade that followed. And far more often than not in the 1960s, the instrument wielded by the bass players in the majority of those groups and by the top session bassists in the world’s great music centers was the Fender Precision. The 1960s was the decade in which the Precision, no longer a newcomer, cemented its reputation as the workhorse bass guitar; unrivaled in tone, feel and sheer indispensability. It was a marvelous and elegantly simple combination of stylish form and efficient design that sounded great and played comfortably. On top of all that it was tough and reliable—a Precision Bass could take a beating out on the road and in everyday studio use. Working bassists loved it, and session producers demanded it. 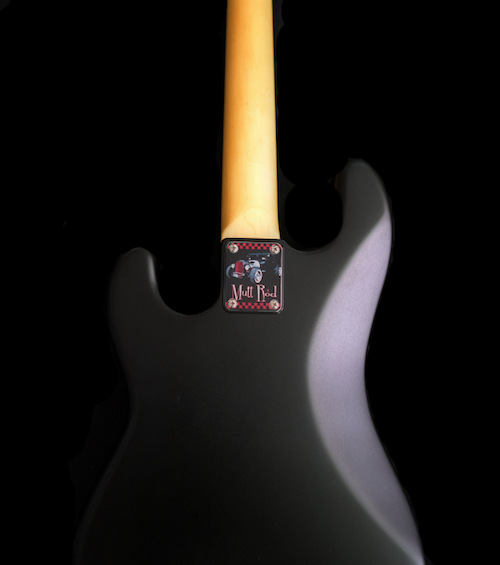 As the 1960s drew to a close, a larger headstock logo replaced the Precision Bass’s previous “transition” logo in 1969, and the extra strap button on the back of the headstock added in 1960 was discontinued. A notable artistic development of that year came with the release of the eponymous debut album by the Meters, which introduced the world to the impeccable Precision Bass chops of master New Orleans funk/soul bassist George Porter Jr.
And so the Precision Bass finished its second decade, more firmly ensconced than ever as the world’s preeminent workhorse bass guitar. Unlike its 1950s reign as Fender’s sole bass guitar, the Precision spent the 1960s joined by its younger brother, the Jazz Bass, yet the two complemented rather than competed with each other. Other makers abounded by the end of the ’60s, but the Precision and the Jazz basses together dominated the world of electric bass with impunity. Exciting new musical territory awaited discovery, and no electric instrument was better suited to the journey than the Precision Bass, as elegantly simple and powerfully elementary as ever. Bigger bass sounds and greater bass horizons were looming now." This bass started out as a 1985-1986 Fender Precision Bass from Japan and I had the body custom painted to exactly match the paint that my custom car shop in Indiana used to paint my 1929 Ford Model A "Mutt Rod". The same pin striper who striped the car - Jim Studinsky - also pin striped the bass body in red and white highlights to match the car. This bass weighs in at 7.8 lbs and the width of the neck at the nut is 42mm. It features a Seymour Duncan Basslines pickup and a custom diamond metal control plate. The bridge and input jack as well as the controls, wire and pots are all the original by Fender. I couldn't bear to put the pick guard back on, as it would have interfered with the pin striping and the overall aesthetics of the instrument. The black steel knobs have mother of pearl inserts and the DM Strings - "Red Devil" Round wounds - are a take off on the red grill of the car. A battery powered Roland Cube bass amp lives in the trunk of the car and the bass always goes to the car shows.